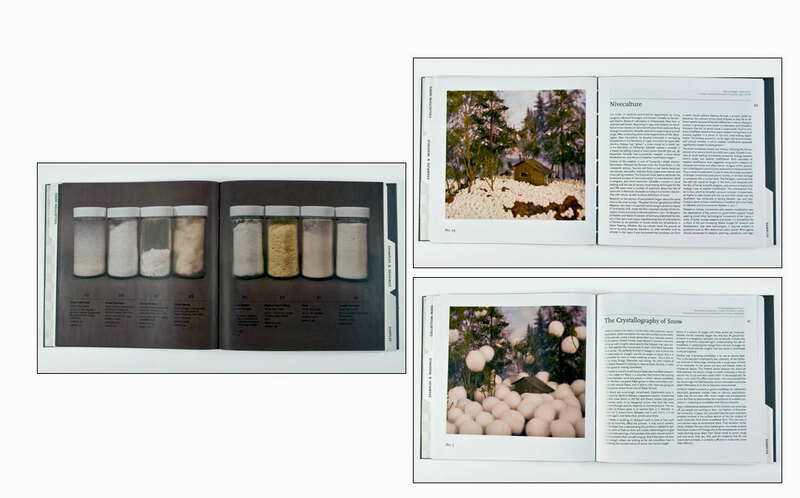 Heidi Neilson is an artist addressing topics such as weather, fake snow, and the cultural landscape of outer space. Her work is often collaborative and publishing-based. New York: Heidi Neilson, 2013. Edition size not stated. 5.83 x 8.26"; 60 pages. Casebound. Digital offset printed. Softcover illustrated wraps. 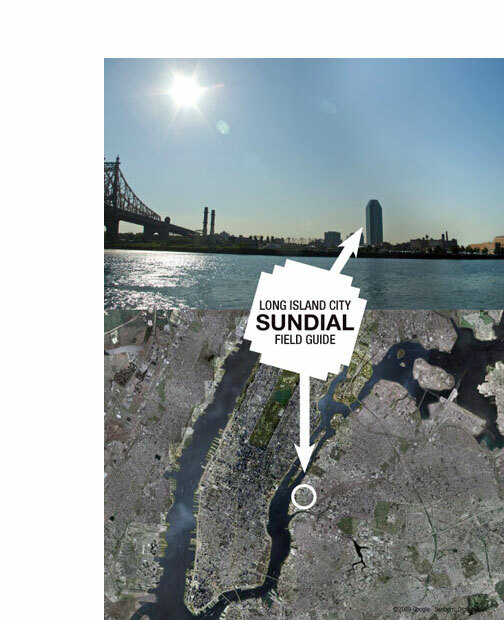 Heidi Neilson: "The Long Island City Sundial is a neighborhood-wide sundial in Queens, New York, just across the East River from Manhattan. The prominent 201-meter Citicorp building's shadow can be tracked across the neighborhood and used to tell time throughout the day and year. Since this sundial's shadow-casting spire (the gnomon) is vertical instead of at a customary angle, the length of the shadow at any given time changes from day to day. The dial is the irregular terrain of buildings and elevated roads and tracks in a neighborhood that slants down toward the nearby East River. 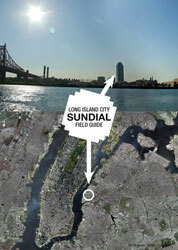 The Long Island City Sundial Field Guide assists reading and experiencing the sundial through maps, landmarks, observation areas, tours and events." New York: Heidi Neilson, 2011. Edition of 25. 5.75 x 11.125 x 1" 36 pages. Inkjet printed. Drumleaf case binding with the spine and half the boards cloth-covered and the foredges and half the book paper-covered. Heidi Neilson: "Atlas Dream Sequence is a series of collages made from maps, where each page spread is an imagined magnification from the previous spread. 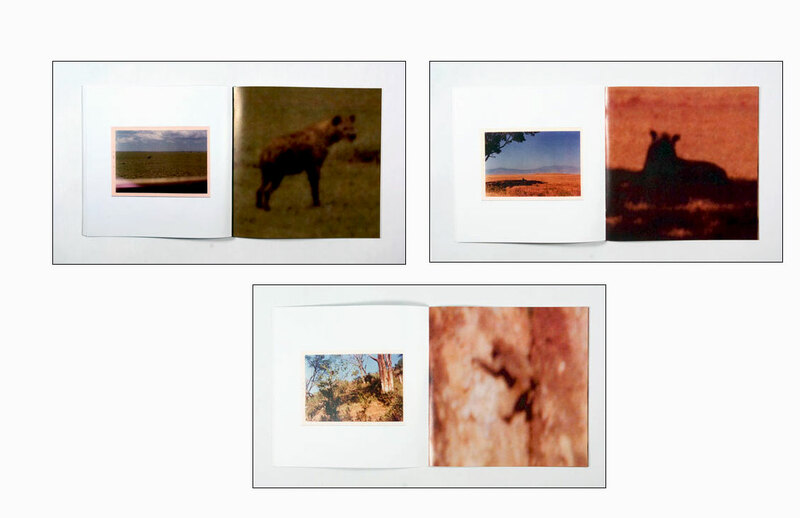 The front and back of the book are equal; the sequence of images can be read from either direction." The Book Artist is in Wonderland: depending on which end of the book your start from, the views either zoom in or zoom out. Perspective is all, but never final. New York: Visual Studies Workshop, 2010. Edition of 100. 8.5 x 9 x 1"; 75 pages. Printed on a HP Indigo Press. 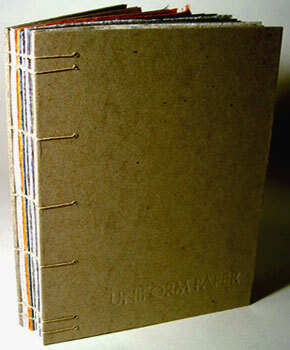 Hand bound. Exposed spine binding. Reprinted texts are used with permission. 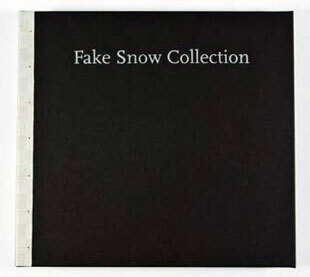 Fake Snow Collection was produced while Neilson was artist-in-residence at Visual Studies Workshop in November of 2009. The artist-in-residence program at VSW is supported by the National Endowment for the Arts. Does objecting to black garb for The Nutcracker's snowflake dancers make you a racist? Why does snow show up so frequently in paintings from the Northern Renaissance? Inquiring minds … will find consummation in Fake Snow Collection. New York: Heidi Neilson, 2009. Edition of 100. 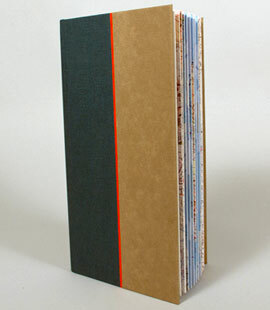 7.5 x 7.5"; 26 unnumbered pages. Digital-offset printed, saddle-stitch bound. 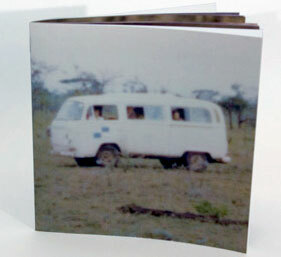 Colophon: "The photographs for On Safari, 1976 were selected from the archives of Lilian Neilson (1913 - 1996). It is a series of reproduced photographs with zoomed-in excerpts." With this simple book, photographer-bookmaker Neilson asks some not-trivial questions about photography: Is its value in recapturing the past? Remembering the past? Reproducing reality, whatever reality is? How much does focus play a part? Is the past fuzzier the farther (literally and figuratively) we are from it? Or does closer vision blur the picture? New York: Heidi Neilson, 2012. Edition of 50. 5.5 x 7 x .25"; 16 pages. Digital offset printed. Pamphlet stitched by hand. Laid in paper wrapper with title stamped in gilt on front cover. References listed on colophon page. Heidi Neilson: "Tranquility Base is a visual catalog of items left at the Apollo 11 landing site on the moon made with photos of miniature handmade models in diorama settings." Introduction: "Most equipment launched for the Apollo moon missions remains on the moon. Over 100 items occupy the Apollo 11 Tranquility Base landing site. The exact locations and conditions of most of the items were not documented at mission completion and the site has not yet been revisited. This is a constructed visual guide to items at the site." New York: Women's Studio Workshop, 2010. Edition of 70. 10.25 x 8"; 24 pages. Letterpress printed with screenprinted images. Text printed in Future on Rives heavyweight paper. 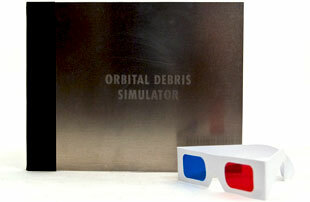 Viewable in 3D with enclosed anaglyph glasses. Bound with aluminum clovers and black cloth spine. Heidi Neilson: "Orbital Debris Simulator describes the phenomena of ‘space junk’ in the earth’s orbit, showing points of interest between the moon and the earth such as geosynchronous orbit, medium earth orbit, and the International Space Station. 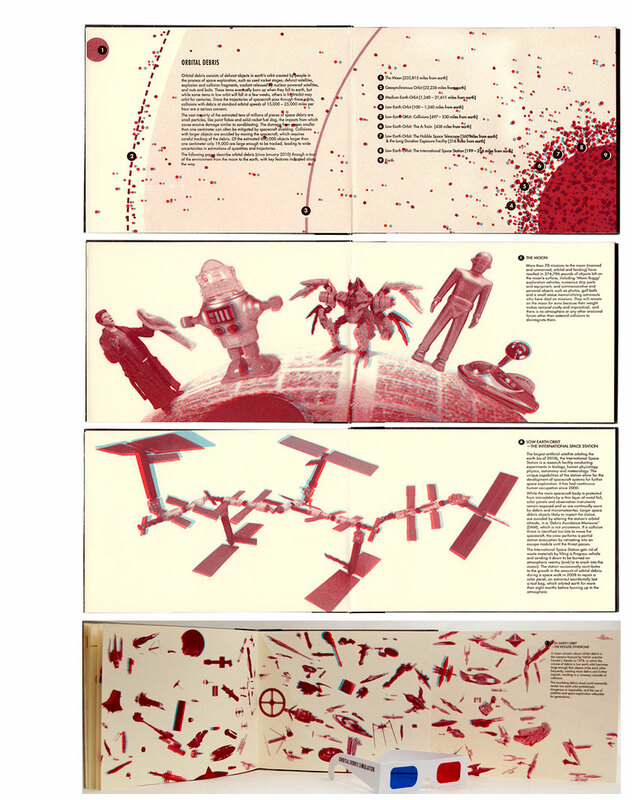 Images of space toys – spaceships and action figures from various science fiction ‘universes’ as well as replicas of actual spacecraft – are used as stand-ins for the orbital debris itself. "I wanted to use the metal for the cover for its spaceship-y-ness. You’ll find that it fingerprints easily (aluminum) but the fingerprints also clean off easily with windex on a paper towel. The covers will also probably get scratched (and are a little already in addition to the sandblasted title) but this is fine--planned and appropriate even--as the text references scratches, dings and abrasions from the impact of orbital debris on spacecraft. " Introduction: "Orbital debris consists of defunct objects in earth's orbit created by people in the process of space exploration, such as used rocket stages, defunct satellites, explosion and collision fragments, coolant released by nuclear powered satellites, and nuts and bolts. These items eventually burn up when they fall to earth, but while some items in low orbit will fall in a few weeks, others in high orbit may orbit for centuries. Since the trajectories of spacecraft pass through these orbits, collisions with debris at standard orbital speeds of 15,000 - 25,000 miles per hour are a serious concern." New York: Heidi Neilson, 2008. Edition of 100. 7.5 x 7.5"; 16 pages. Digital-offset printed. Saddlestitch bound. Signed and numbered by Neilson. Heidi Neilson: "Home Planetarium Survey displays seven toy planetariums and photograms of the constellation Orion as projected by the planetariums." Oshizorakodu Planetarium Kit. Tomy Co.
National Geograhic Society Star Planetarium. Uncle Milton Industries. Portable Junior Planetarium No. 6500. Harmonic Reed Corporation. Our amazing Home Planetarium. 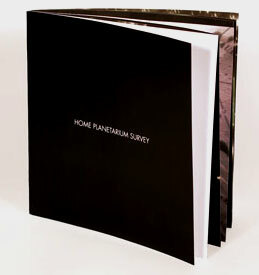 Educational Design, Inc.
Otona no Kagaku Planetarium Kit. Gakken Co.
New York: Heidi Neilson, 2004. Edition of 100. 9.75 x 8.5" with 32 pages. Black cloth spine with paper covered boards. Letterpress printed on Mohawk Superfine 80 lb. cover paper using Adobe Garamond and Avenir typefaces for informational text. 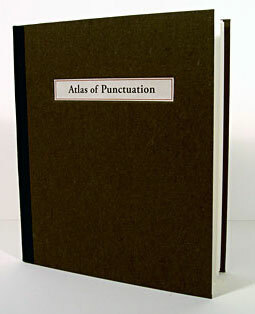 Typefaces used on the punctuation distribution pages match those of the source books as closely as possible. Created with support from Women's Studio Workshop. 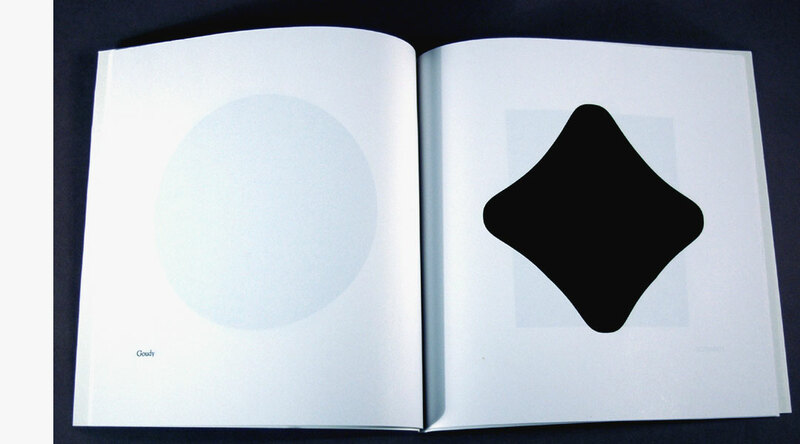 "But the first question a viewer has when confronted with these pages is 'How did she do it?' You can trace the punctuation of one page of a book, of course, but 383 pages - as in One Hundred Years of Solitude - is another matter. "'I first went through each book, page by page, with a sheet of clear acetate and a pen, tracing the end-sentence punctuation, registering each page,' Neilson said. 'When the sheets became confusing, I'd use another. When I finished that, I stacked the acetate sheets and scanned them. Using the Adobe Illustrator graphics program, I replaced all of my hand-traced punctuation with typeface punctuation. The result was clean vector graphics, which I sent to a place that makes magnesium plates that are mounted type-high, meaning they can be printed letterpress as if they were a block of set metal type. I printed the book letterpress with the plates." New York: Heidi Neilson, 2005. Edition of 10. 5.75 x 9.25' with 19 pages. Accordion fold structure with black cloth boards. Etchings, printed letterpress on BFK Rives paper. Richard Goodman, Fine Books & Collections (January/February 2008): "If ever an artist was inspired by her neighborhood, that artist is Heidi Neilson. Neilson lives in Long Island City, a pocket of New York City just across from Manhattan, in Queens. It was once supposed to be the next up-and-coming neighborhood. Instead, after a brief flurry of renown, it settled back into its old identity of small warehouses and undistinguished apartment buildings and diners, all basking in general contentment at being left alone. "... Her neighborhood has inspired her as a book artist…. In 2005 she created A Block of Alleys, a foldout book of etchings she made of all the alleys that she walks near her studio. You can open a single fold and see a single alley, or you can unfold the book completely and see the entire walk, alley after alley, as a panorama." New York: Heidi Neilson, 2011. Edition of 120. 2.75 x 2"; 48 pages. Miniature. Digital offset printing. Perfect bound. In glassine envelope. 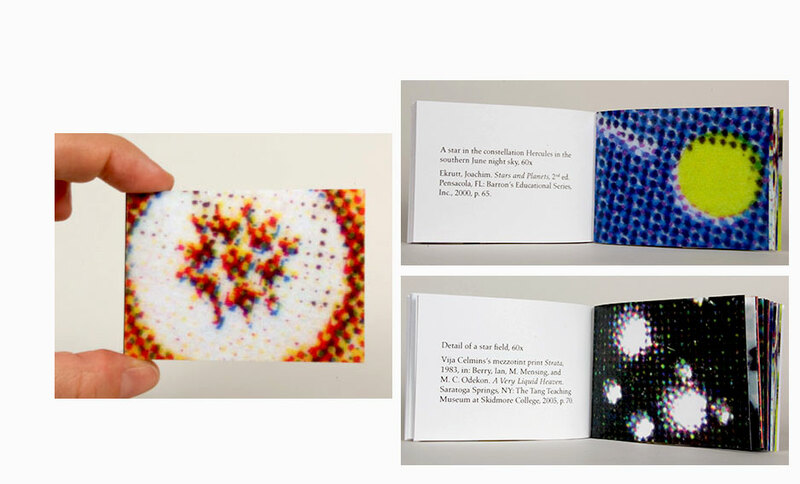 Colophon: "The images in Stargazing by Microscope were selected from books, magazines, and maps found in a single residence in Queens, New York, and were photographed using a Digital Blue QX5 computer microscope." New York: Heidi Neilson, 2003. Edition of 100. 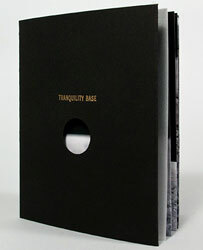 8.5 x 8.5" with 56 pages in white and black wraps. 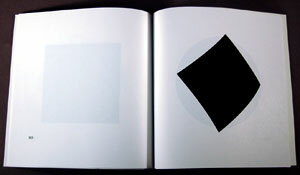 Richard Goodman, Fine Books & Collections (January/February 2008): "While learning letterpress, [Heidi Neilson] noticed that some of the periods she was setting looked damaged. They weren't perfectly round, as she had expected they would be, but they weren't, in fact, damaged. 'I was impressed that someone had actually designed a period,' Neilson said. She decided to demonstrate this dramatically and so chose over two dozen typefaces and enlarged their periods 3,000 percent…. The result is a book of periods that are as different as children in the same family are. Some are perfectly round, some perfectly square, while others veer into the oblong, the oval, and even, as in the typeface Papyrus, the indescribable." New York: 2004. Edition of 33. 6 x 8". 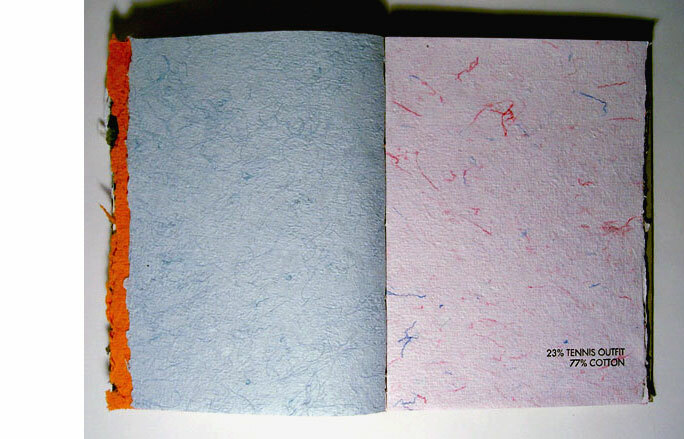 Entirely of handmade paper. Coptic bound by hand between raw boards. Title blind-stamped on the front cover. Colophon blind-stamped on inside of back cover. Signed and numbered. The pages are ordered roughly in sequence of the wearing of each uniform in a lifetime (where uniform is loosely defined) — so that the pages in order are: diaper paper, underpants paper, ballet costume paper, brownie uniform paper, etc. and later… wedding dress, tuxedo, prison jumpsuit, surgical scrubs, etc…..